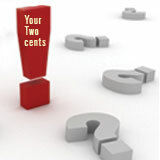 "Your Two Cents": Body slimming garments, blessing or reinforcement that "bulges are bad"? Your Two Cents: Are body slimming under garments like Spanx and girdles, a blessing to help us look our best or are they reinforcement that having bulges from excess pounds is bad or unattractive somehow so you need to hide them? 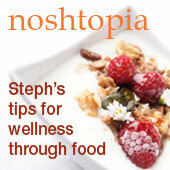 Something to chew on: How can your health go up if you keep putting yourself down? One school of thought in motivation tactics is to berate and humiliate someone into change. But think about this for a moment, how can your health go up when you or anyone else puts "you" down? How can you feel wonderful about yourself and life via fault finding and critical nit picking? A negative cannot create a positive. Like energy can only create and attract like energy. An extreme example of using disdain as an incentive method is this guy Michael Karolchyk who owns the "Anti Gym" in Denver who has quickly garnished A-list a**holeness around the Internets for his "Chubbies get no hubbies" style of weight loss stimulus. He's like that meat head bully in high school who likes to terrorize fat girls by demeaning them and making them feel inferior. Weigh-in Wed: #35 "Random thoughts on eating in the car"
The one habit change that has helped me get and stay slimmer is the stopping of eating major meals in my car like it's a restaurant on wheels. I'll eat things like a food bar or some fruit, but gone are the days of eating burritos, sandwiches, and pizza in my ride. Because I don't eat meals in my car any more, I have noticed that I don't feel the need to go through any kind of drive thrus which typically belong to fast food joints. Although, I have to admit that over the holidays I HAVE to go to Jack in The Box because I gotta get my hands on one of those Jack antenna balls. I'm talking about the ones with the reindeer ears and sun glasses. You could give me one of those as a Christmas gift and I would be elated. I'm simple that way. This is my own observation, but culturally, I think that eating in the car by oneself is an American thing. In many countries, meal time is a big social thing or a time for family to be together, so people eat together in homes or restaurants. You typically won't see a whole family eating dinner in their mini van. Now in the U.S., that would be different as many of us are always in a rush or hurry to get somewhere. We (Americans) don't savor and relish meal time like people do in other countries. I'm not saying it is a good or bad thing. It is just a reflection of how many of us live. I do believe there is a major correlation to the amount of time you spend eating by yourself in your car to the amount of weight you gain or struggle to keep off. Any thoughts on that? 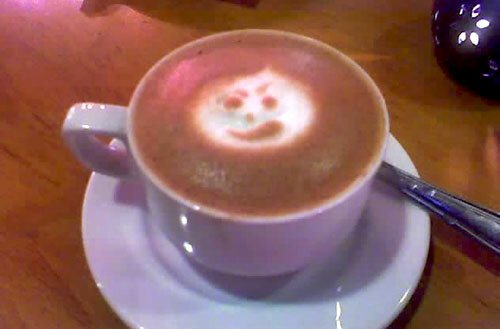 Checkout the cute ghost face the barrista drew for me in my Spicy Hot Cocoa. I took the pic with my cell phone camera so the colors are not as vibrant as the real thing. But man-o-man this cup of heaven is made with chocolate from Venezuela and it is really divine. It's my top splurge treat. I get my fix at one of my favorite cafes, Coupa Cafe in Palo Alto near Stanford University. As well, I have a tin of the cocoa mix at home. You can buy cans of this hot chocolate at most gourmet stores and cafes, or directly from the maker Chuao Chocolatier on their website. The cocoa comes in 3 flavors Winter, Spicy Maya, and Abuela, and I am telling you it is THE BEST hot chocolate I have ever had. My world is blissful when I drink this cocoa. Truly! One tip, if you buy the cocoa and make it at home you have to make it in a pot because there are chunks of chocolate in the mix, and the chunks do not melt well in the microwave. At home, I usually make my hot chocolate using rice milk, and it tastes just as good as a non-fat milk version. I'm telling you. If you love chocolate, this cocoa is a must try. Oh no they didn't: 6-Week Body Makeover needs to nix "problem area sketches"
Oh my goodness! They started showing the "success" stories with their "before" photos all sketched up with the problem areas like they do at a plastic surgeon's consultation. I was horrified! 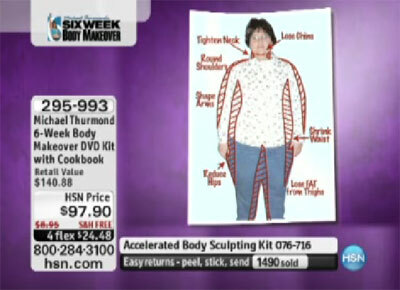 Worse, there's the video product demo on the HSN website where you can see this stuff all the time, for crying out loud! I don't know which advertising is worse, sketching up the non-existent problem areas of already perfect looking people with the tagline "Happily Ever After" or the 6-Week Body Makeover where they take "real" people with real problems with extra pounds and sketch them up like a cow with the meat cut areas. I realize that the marketing of weight loss products is highly competitive, but companies, come on! It is possible to use uplifting messages and images to sell your products that do not require dehumanizing tactics. Get creative! What do you all think? Can you guess who this celebrity is doing her modern version of 60's model Twiggy? I totally guessed wrong. The answer is here at The Daily Mail. Photoshop and lighting can make a huge difference, huh? Okay, we're back to Two Tiny Changes Tuesday, the day you get some ideas to help inspire you to make tiny changes that will help you reach your healthy weight goals and not trigger your Inner Resistance Monster. The point is to start making changes so small that you don't even notice you're "trying." 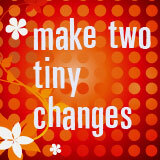 Over time, small changes can add up to create big results, something we all want. Drink one paper cup full of water a day. For those who hardly drink any water at all and are struggling to get more H2O, drinking a paper cup of water, even if it is a small cup, is better than nothing. This small cup could lead you to drinking more water each day. If you're in the habit of reading while you're on the elliptical or bike, replace one of those days this week with listening to music in your mp3 player. FitSugar has a great tip on this, "Fit Tip: Make it Count." This week pick one day and eat one new vegetable that you haven't eaten in the last 3 months (or ever) and have that veggie for either lunch or dinner. Take 5 minutes and quickly list 3 small things you'd like to "let go" off this year. You don't have to do anything on the list right now. Just start the process of writing it down. If you're feeling ambitious, include a "To do by [insert date]" for each item on your list. 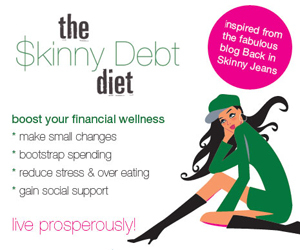 Ideas: give away 2 of the 6 pairs of skinny jeans in your closet, clean out your "junk" drawer, donate books collecting dust on your bookshelf to a non-profit, donate pieces from your "fat" wardrobe to Goodwill. Next time you go eat Chinese food, try either passing on the Soy Sauce, using 1/2 the soy sauce your normally use, or ask that your fried rice not be cooked with soy sauce. Cutting down on the soy sauce will help lower salt consumption. I held my tongue when I wanted to retaliate with something equally petty during an argument with a close friend. I ate a green salad two extra days than normal. I got it from the Whole Foods salad bar which is pricey but it was worth the money in convienance. A $2.49 Avocado testing my organic "threshold"
I've been craving Avocados like mad since I started the half marathon training. 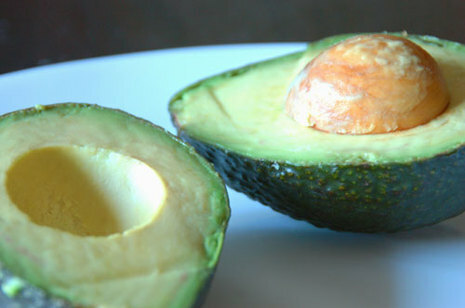 Avocados are a great source for healthy fats and "nearly 20 vitamins, minerals and beneficial plant compounds that can contribute to the nutrient quality of your diet." Because I've been on this whole anti-pesticide and anti-preservative "get clean" crusade, I can't have just any avocado, I got to have an organic one. But at $2.49 for an organic avocado, this is where my wallet and desire for health start to clash. We all have an organic "threshold" meaning we get that you pay more for organic produce but there comes a limit to just how much you're willing to fork out especially when you live on a budget like myself. When I bought this avocado, I debated going to another grocery store where I knew I could get an avocado for 99 cents, but it wasn't organic, and it was about half the size as this one. Plus, was it worth it to me to drive to another store just to buy one avocado. I decided my time and effort plus gas wasn't worth saving the $2, so I got this pricey puppy from Chile. I do have to say though that this avocado was really delicious, and that it's vibrant flavor in my turkey and Colby Jack sandwich, and in my Arugula & Tomato salad the next day made me forget all about it's hefty price tag. I have a love/hate relationship with the Google AdSense advertising program and their weight loss category advertisers. As a publisher, I love the ease of putting up the code just once, and then making ad revenue while I sleep. There is no maintenece. It's easy, and the reporting system is fabulous. Looking at the Google Adsense Page Views stats makes me feel like a rock star because the numbers are always higher than what Google Analytics or TypePad stats says. I know they are different counting systems, but when you're a blogger trying to make a living, you tend to gravitate to the "better looking" numbers. 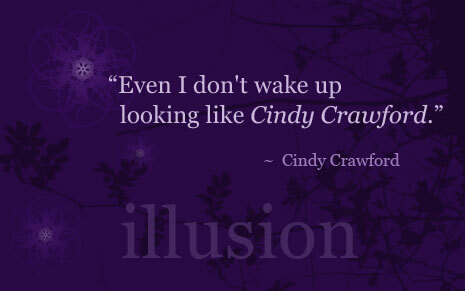 Clothing size or web traffic, it's all the same kind of manic obsession. My blog is old enough too now where the ad revenue is much greater than before and allows me to pay for bills like phone and cable. I hate the fact that as the publisher, I am not given more control to filter out the types of ads that appear on BISJ. Yes Google has a "Competitive Ad Filter" but you have to enter the url of each offending advertiser. Now, when it comes to the subject of weight loss, I have no doubt that Google has millions of advertisers related to weight loss and weight management. There is no way I can monitor ALL of those companies, and submit each one of those urls. I do not understand why Google will not give us publishers the option to filter by subject like NO ads about quick weight loss like "lose 30lbs in 30 days," or ads about Hoodia, liposuction to lose weight, or diet pills. I know it can be done but Google wants to get rich so they make it hard for ads placements to be limited. Good for Google, but a pain the arse for the publisher who has higher senses of consistency and integrity. I get emails from some of my readers who chastise me about my apparent hypocrisy in that I write about healthy weight loss, and that sitting right next to a post will be a Google Ad reading "Lose 9lbs in 2 days." Those who blog and use the Google AdSense program understand how stuff like this happens, but someone who is not savvy in the workings of Google advertising doesn't know and doesn't care. And, they are right. I understand their gripe. The subject of weight loss is very tricky in terms of search. It's not like blogging about tech, business, sports, or even food. It's pretty tough to find an offensive ad in those niche topics. But in weight loss, you get the gammet of healthy messages and dangerous ones. One time I had ads about, "Anorexic Get Skinny Using..." I'm not kidding. So, as a person who needs to make a living, and as a blogger who wants to be consistent in advertising and voice. What do I do? I am constantly torn by this subject. I'm looking avidly for new sources of income that allow me to maintain consistency. Recently, I joined a new ad network that is supposed to help me, the publisher get more access to different ad inventories which is terrific. Google Adwords is part of their inventory so that is why you're seeing more Google ads around here. But, the big BUT again, I'm finding the same problem in that I can't filter out specific topics. Anyone got any ideas? I could use some insight.